Moorlands Farm was one of the pioneers of the commercial fishery scene and is now owned by Mark Foster and Shaun Thomas. It’s now an established and popular seven-lake complex, with the venue providing first-rate facilities including a toilet block, cafe and on-site tackle and bait shop and a licensed bar. Six of the lakes are of interest to competitive anglers with depths averaging six feet on Meadow, Bank, Island, Moors, Middle and Silver. Other than Island, the venues are quite open with no features, other than aerators and some inside reed cover. In summer the fish are well spread out and there are really no noted hotspots with match winning weights coming from any peg. Moorlands is famous for its carp bags but there are some quality perch like this one held by fishery manager Mal Watson to be had too. In the winter, the fish tend to follow the wind and the pegs in the teens and 50s on Meadow, and the teens and low numbers on Moors, plus 5-14 and 17-26 on Bank are all noted. There are no hotspots on Silver, which these days holds plenty of carp as well as silver fish after an attempt to successfully run the water as a silver fish only match venue failed dismally. All the lakes have a very high stocking density of 70 per cent carp, 30 per cent silver fish. Venue regular Grant Albutt with a typical bag from Silver. 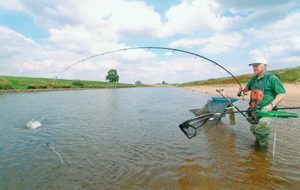 Overall there are 210 pegs on the seven pools and the pole is the best approach on all of them, although in winter when the water is clearer and early on in matches the fish can be beyond pole range. Generally speaking, when fish are on the pole line there is no need to go beyond 13 metres. From May onwards a meat and pellet approach tends to be the best way of keeping the bigger fish interested. Introduce a medium pot of pellets (bought on site) at the start and then feed a few every fish. Like many commercial fisheries, you need to gradually build up a marginal pole line as well, and this may be your key catching area in the last third of the session. In winter and on cooler spring and autumn days, tactics need to be very different and you have to feed sparingly. Mal Watson has made a name for himself in the winter matches feeding nothing at all, just relying on a single hook bait to catch. 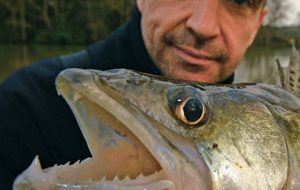 “Fish do not eat much in winter, especially the bigger carp, and you only need a dozen carp to win a winter match at Moorlands,” he says. “If I put loose offerings around the bait, there is less chance of those occasional feeders picking up the right one. Mal will use both the waggler and the pole in the winter and the baits he relies on are single corn, meat and pellet. He generally uses the corn in conjunction with the waggler and he prefers inexpensive supermarket own brands. “Own brands contain more grains of corn with the harder kernels still attached, and these are better for casting with the waggler,” he says. “The soft grains can cast off too easily.” Pellets are Mal’s number one choice for pole fishing in winter at Moorlands. He flavours his hook pellets with additives and one of his favourites is Corn Steep Liquor. “The soaked pellets are particularly effective on the pole because they can be too soft to cast any distance on the waggler and I just feel flavours give you a little edge, sometimes sparking a fish into feeding that otherwise wouldn’t. As at many fisheries, the fish generally move further out from the bank in winter and thus into waggler territory. “In summer fish will come right into the margins because the water is coloured and they feel safe,” explains Mal. “But in winter the fish can see the anglers and they move out. Somewhere around 16-20 metres is a serious target area on a lot of still waters in winter. “You can catch on a long pole as the session progresses, and by long I mean a minimum of 12 metres. But in general I’d be starting the session by fishing out of normal pole range,” he adds. Lines wise in summer it’s 0.15 mm straight through while in winter when the carp are more sluggish you can go down to 0.10mm. In the warmer months, usually from May to September chopped worm and caster can be a winning method. Usually fished on long pole, 13 mts plus, the aim of this method is to get the fish competing for bait up in the water. Starting on the bottom, feed is introduced regularly through a small pot attached to the end of the pole. When line bites or foul-hooked fish become a problem this is the signal to begin fishing up in the water, anything from 6″ to 2ft deep. This is the method used by Stu Palser to catch the record 288 lb in 4 hours on Peg 54 Meadow Pool. Although we’ve talked about the matches, the venue is extremely popular with pleasure anglers. The advice if you can pick your peg is to follow the wind and look to fish a quieter area. You can drive all around every pool at Moorlands and therefore park behind your peg. All in all it’s a great venue for the match or pleasure angler. Pellet is a key hook bait at Moorlands in summer and winter. In winter Mal will fish a single or double pellet on a long pole line over no feed at all, and he will often flavour his hook bait as he feels that in colder whether flavours like Corn Steep Liquor can trigger a fish into feeding. Contact: Tel: 01299 250427. Day Tickets: £6 before fishing from the café. Evening ticket: £4.50. There is a regular match card with matches several days a week and two some days and events are well attended all year round. It’s also very popular water with clubs. Booking fee is £6.50 a peg with reductions for multiple bookings, £5 October – February inclusive, and any of the lakes can be booked. Shaun Thomas have run a series of junior matches through the summer holidays with the backing of Shakespeare, Mosella, Van Den Eynde, Octoplus, Kamasan and Moorlands Tackle for the last ten years and anyone interested in taking part should call the fishery. The match records are five hour 242lb; four hours 288 lb and three hour 220lb. Barbless hooks only. Keepnets only allowed in matches and nets must be dipped. Luncheon meat must be cubed, not riddled. No liquidised or floating baits. 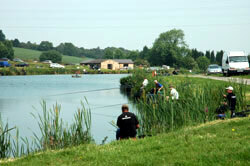 Baits allowed are casters, corn, worm and carp pellets, which must be bought on site. You are limited to 2 pints of feed pellets in five–hour matches and five pints of bait in total, but you can bring your own hook pellets. Braid and The Method are banned. How to get there: From Junction 6 on the M5 take the A449 towards Kidderminster. The fishery entrance is well signposted just beyond the Hartlebury roundabout.